This Sunday is the Academy Awards. The one night of the year that I actually watch an award show even though most of the time I haven't seen any of the films nominated. It's true. This year will be different though, I've seen only one film, but I'll be filling out a ballot making guesses before the ceremony begins and trying to see how many I got right versus how many my husband guesses right. 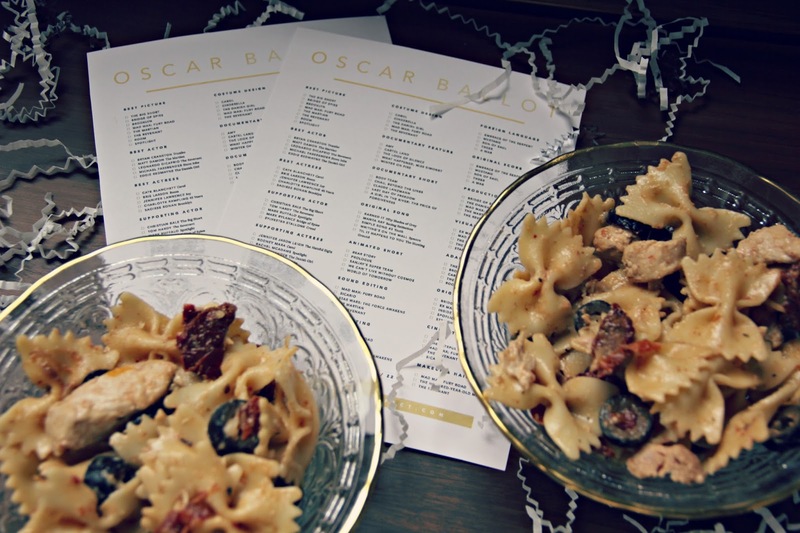 Oh, and we'll be eating this delicious bow tie pasta recipe. 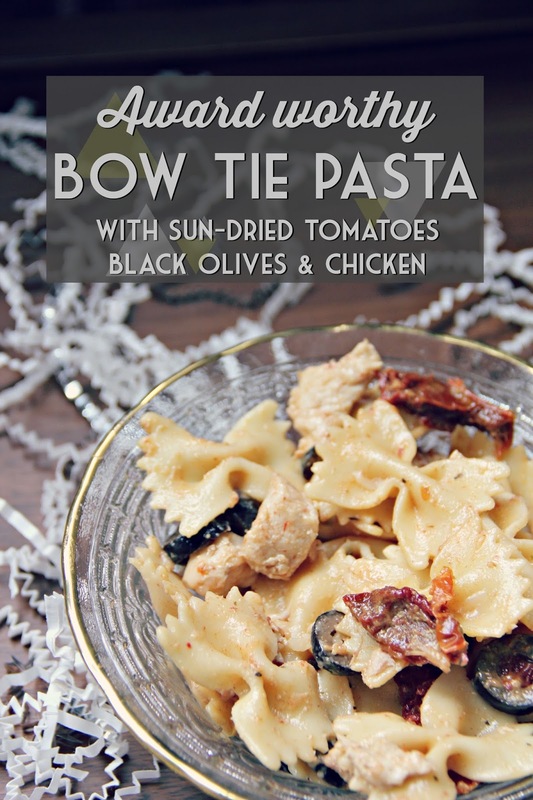 Bow ties totally are on theme with the Academy Awards, as is the red of the sun-dried tomatoes and black olives. Perfect! - Heat oil in a large skillet over medium heat. - Add tomatoes, olives, and garlic, cook for 1 minute. - Stir in chicken, soup, milk, and basil, stir occasionally and cook until mixture is hot and bubbly. - Put pasta in a large serving bowl. Pour soup mixture over pasta and toss to coat. - Sprinkle with cheese and enjoy! You guys, this recipe is so good. It's warm and creamy, yet it isn't too heavy. It's also delicious leftover and cold. 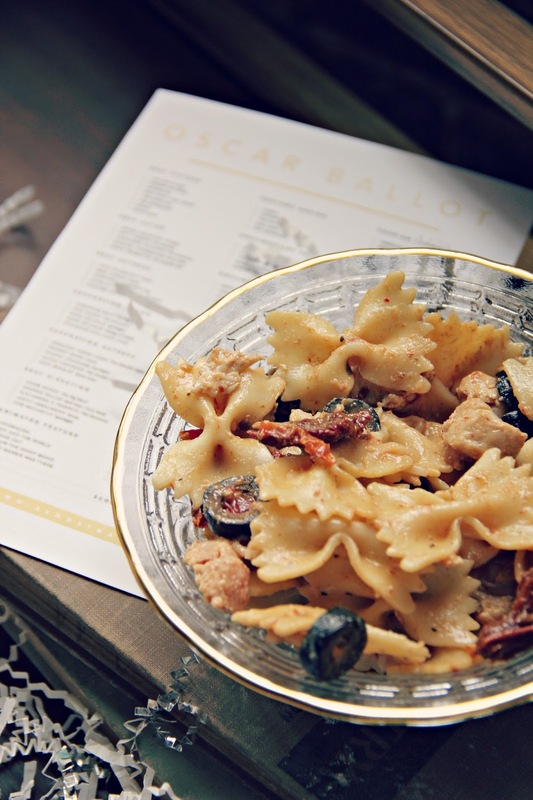 These adorable Oscar ballots can be found here. So, print them out, make your guesses, make some pasta, and watch the Academy Awards on Sunday!! Doesn't that sound like a good plan? I thought so.